Sentinel-2A Image of the burning wildfire on August 8th, 2017. Click to bigify. 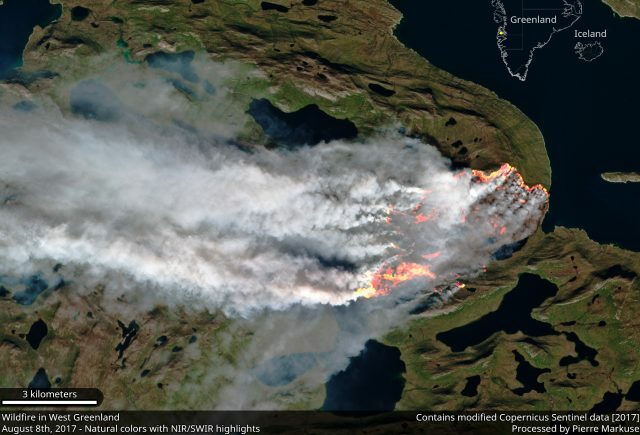 In late July 2017 what was most likely a peat wildfire (or a combination of grass, shrubs, and peat) started in western Greenland, about 150 kilometers northeast of the city of Sisimiut, Greenland’s second-largest city. While not unheard of, wildfires in this area are usually rare, although there is not enough information about wildfires in this area to really tell how likely they are. The fire burned for several weeks and finally slowed down mid-August after the area received some rain. Some time later in August, on or around the 21st, the fire stopped. July/August 2017 Greenland wildfire progression by Stef Lhermitte. Click to bigify. With an affected area of 23.5 km² it was small compared with most of the recent wildfires in Europe and the western USA and Canada, still for its location in western Greenland this was a remarkable size. In the animation you can see the slow progression of the wildfire from July 29th, two days before it was first spotted from a passenger plane, to August 21st. 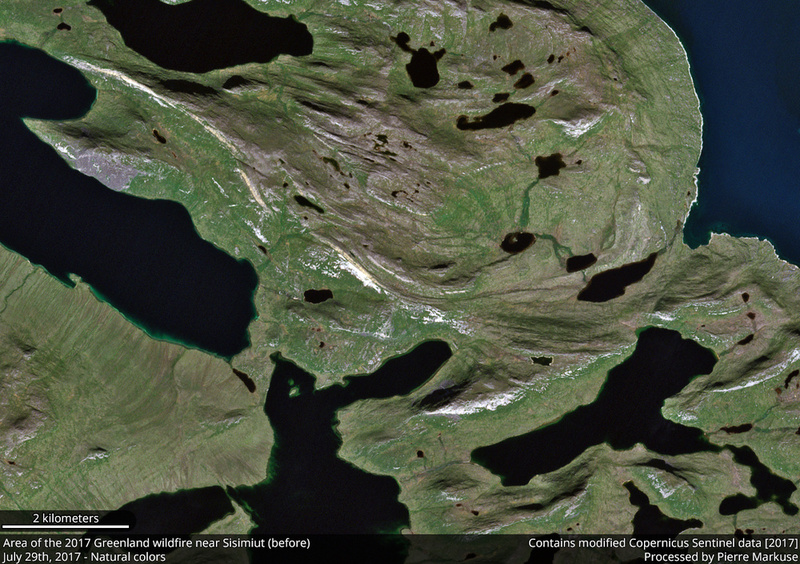 The animation was compiled by Stef Lhermitte using Sentinel-2 and Landsat 8 images. This article by the Danish Meteorological Institute (DMI) features some fascinating aerial pictures of the wildfire, taken August 15th from aboard a small private plane. The following images, taken by the European Sentinel-2A satellite, are showing the area prior to the wildfire on July 29th, and afterwards on September 4th. Note that in the September image you do not only see the burn scar but also visibly less green vegetation because of the declining temperatures during this time of the year and therefore changing vegetation. You might also notice the longer shadows in the September image, caused by the lower solar elevation angle at that time. 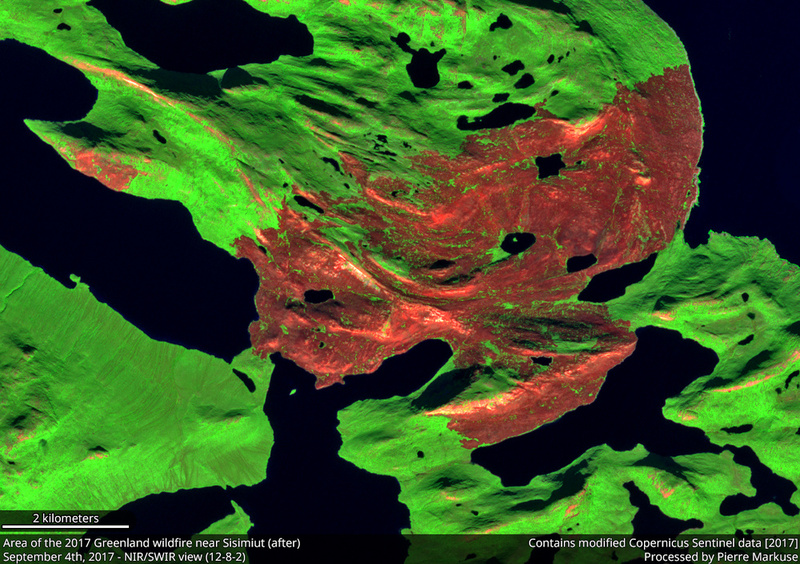 Even with the now less green vegetation in September you can see the burn scar in this natural color image. And here a NIR/SWIR image of the area, using bands 12,8, and 2 of the MultiSpectral Instrument. The burn scar is clearly visible in this view. The red area in the top left part of the image is no burn scar, compare with the natural color image to see that it appears grayish in that view, most likely some type of rock. This is even more obvious in the delineation map provided by the Copernicus EMS here, which is based on a SPOT 6/7 image with 1.5-meter-resolution. 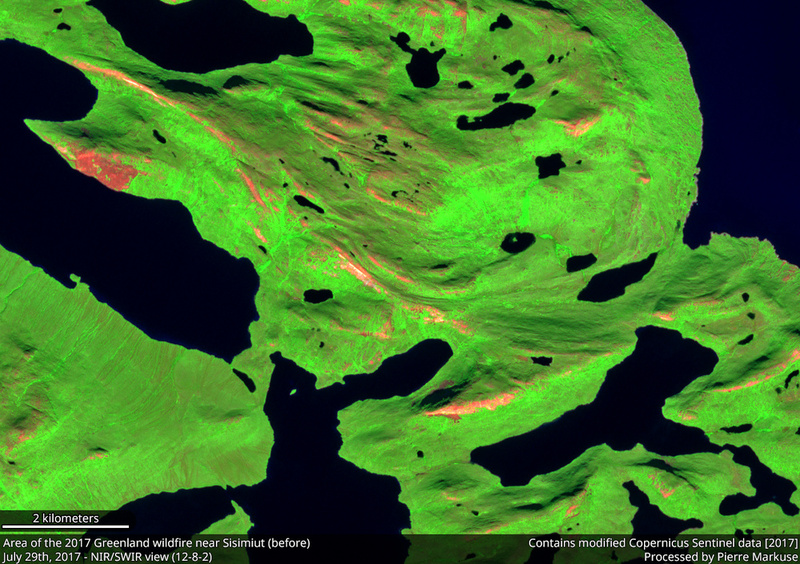 You can also see a spectral difference from the burn scar in this Sentinel-2 band 12-11-8 combination in the Sentinel Hub EO Browser. 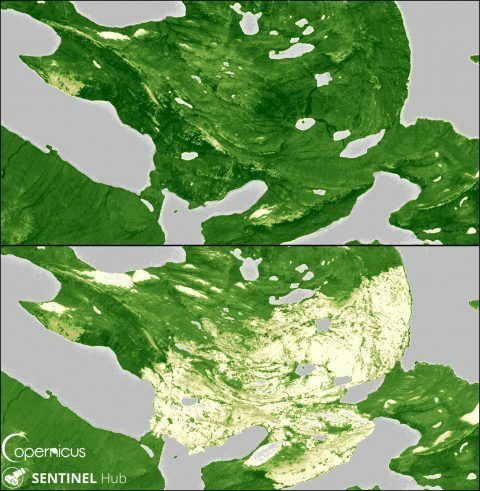 NDVI comparison before and after the wildfire. 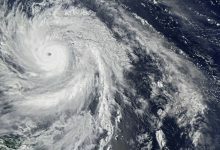 Click image to bigify. The fresh burn scar causes a drop in the NDVI values, this comparison of before and after clearly visualizing the effect. Note that you can also see an NDVI drop in some other spots of the image, caused by the more prominent shadows in the September image. Burn scars in the arctic can persist for quite some time before completely recovering, possibly changing the type of vegetation and facilitating the degradation of ice-rich permafrost, for example by decreasing the ground surface albedo, and therefore increasing the amount of energy absorbed, leading to higher surface temperatures. You can see this surface albedo reduction in the natural color image, the burn scar appearing far darker than the green vegetation, and even darker than the less bright and less green autumn vegetation. It should be interesting to follow the recovery of this burn scar during the next few years and longer. You can download full-size versions of the before/after images with a scale of 10 meters/pixel here on Flickr. More images of the July/August 2017 Greenland wildfire can be found in this album on Flickr. 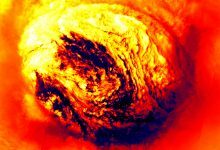 If you are interested in wildfires in general take a look at this album on Flickr, featuring pictures of several different wildfires. 1. ^ Jones, B. M., A. L. Breen, B. V. Gaglioti, D. H. Mann, A. V. Rocha, G. Grosse, C. D. Arp, M. L. Kunz, and D. A. Walker (2013), Identification of unrecognized tundra fire events on the north slope of Alaska, J. Geophys. Res. Biogeosci., 118, 1334–1344, doi:10.1002/jgrg.20113.